Years ago when I was living in downtown Salt Lake, there was this hole in the wall "fresh Mex" little dive that my roommate and I absolutely loved. This was years before Cafe Rio, Bajio, Costa Vida etc... It was the first "fresh Mex" place I personally had ever come across. I thought it was kind of genius...Mexican food that was made fresh in front of you, not greasy, any way you liked it. They had homemade tortilla's, fresh grilled chicken, steak or pork, amazing salads, taco's, burritos, and my personal favorite...the quesadilla's. They were so simple; not a lot of ingredients. The chicken was tangy and juicy; full of flavor. They really didn't need much more. We were a little obsessed, my roommate and I...and that's why we cried when they went out of business. Who would supply us with fresh made tortillas and juicy yummy chicken?? Cafe Rio was still a few years away... Our poor little dive was ahead of it's time. I really wish I could remember the name. Anyway, that's why I had to come up with this recipe. It's about as close as I could get. Just be sure not to over cook the chicken. It needs to be juicy, not dry. I hope you love!! 1. Place the chicken in a large zip lock bag. Add all the ingredients for the marinate. 2. Seal the bag and allow the chicken to marinate for at least 2 hours or up to 6. 3. Grill the chicken. Allow to rest for about 10 minutes, then slice thin on a 90 degree angle. 4. Set the chicken aside. 1. Assemble the quesadilla's by layering a tortilla shell, cheese, chicken, a splash of hot sauce (optional), then topped with another tortilla shell. 2. 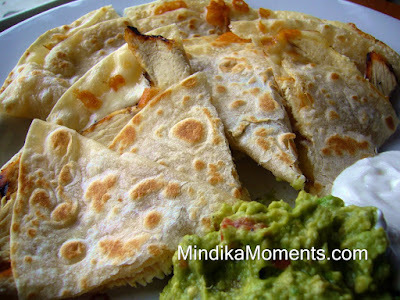 Place the quesadilla's in a 350 degree oven for about 5 minutes or until the cheese melts. 3. Serve with guacamole, salsa & sour cream. I made this dish tonight and the chicken was SO good! Keep these simple recipes coming!